7 Kids and Us: Unbelievably Adorable Dress Up Costumes from Just Pretend Kids! Unbelievably Adorable Dress Up Costumes from Just Pretend Kids! I have the cutest niece on the planet. Everyone who sees my little "buggie" agrees. She is downright adorable. So, when I was offered the chance to review an outfit from Just Pretend Kids, I knew exactly who was going to wear it. I have so much fun taking pictures of Buggie, her amazing personality shines through in every photograph! I spend quite a bit of time looking for outfits to help showcase her uniqueness. 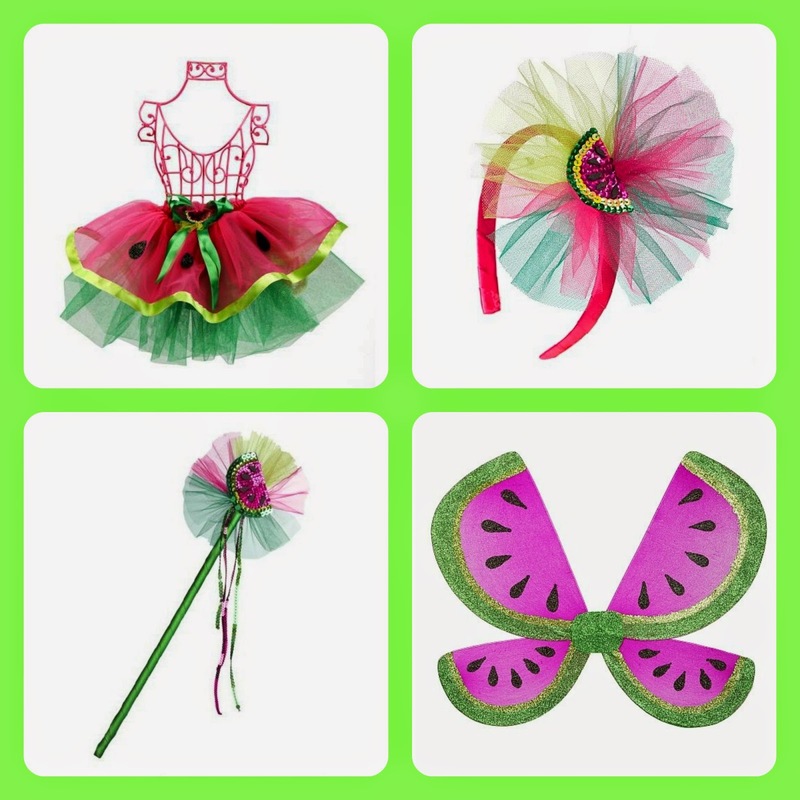 At Just Pretend Kids you can purchase one or all pieces of an outfit, I chose the "Watermelon Fairy" and it was perfect for her. It came with the Tutu, Leotard, Headband, Wand, and Wings. The price for the whole outfit was about $70, which is great for all the pieces! And, again, the pieces can all be purchased separately which I love! The whole outfit was so easy to put on, and it's very soft on the skin, that was noticeable right away. Also, after Buggie wore the costume for the pictures, she ran around the park in it for an hour, and I cannot even begin to tell you how many moms came and asked me where I got the outfit! I also noticed when we went home, the outfit was still in really great shape, I figured she would have gotten it caught on something or it would start coming apart (we have had tutus in the past that didn't last long) but this one looked perfect! There are several other outfits available from the "Fruit Collection" like Lemon and Strawberry! If you are looking for something like a costume, I am really excited about this one! This is the "Court Empress" and looking at it, it looks so nice and really well made. It's available for $68. Just Pretend Kids also has costumes for toddlers and boys! Check out all they have to offer here. A note from the owner of Just Pretend Kids "Our Just Pretend® tutus, wands, wings, accessories and children costumes are made with these same values for quality, comfort and value in mind. When you hold our costumes you will feel how soft they are. We use the finest tulle with just the right finish to make our tutus. Our wands are made to minimize danger from sharp points or dangerous materials. We do not sell any items that we would not want our own children or grandchildren to wear or play with."